"Day I was born the earth turned red..."
Today we mourn with his mother, Eileen, "Miss Hons", his sister Sandra, his two sons, F�don and Jeremy, his brother-in-law Peter and nephew Jeremy, (with Debra) all his family and with all those who proclaimed his unparalleled generosity of sprit. 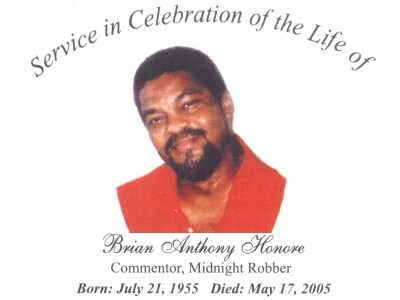 Brian Anthony Honor�, "Sir B" to many of his friends, was born on July 21st 1955 in Tunapuna, to Eileen and Ulric Honor� (deceased). He had the normal childhood to be expected in the Tunapuna of that era, a warm cocoon with family and extended relations. All a short walk away in every direction, under the ever-watchful eye of neighbours children did "what was right". He was christened in this church, St. Charles R.C. and he made his first communion here. Schooling for him was to start at the Tunapuna Boys' R.C., between 1960 and 1963. He then attended Eastern Boys' Government School from 1964 to 1966, where the principal was the formidable O.E. Romilly, and where his mother taught after they moved to Cascade. He entered St. Mary's College in 1966 and studied there until 1974. With his social conscience expanding, especially at the time of the Black Power Movement of 1970, he developed a reputation, at least with one or two of the Holy Ghost Fathers, for being a quote un quote "rebel". Curious thing for a boy who at one point in his early years at St. Mary's wanted to join the priestly order! On leaving school, he worked at the Port Authority and solidified a relationship with The Seamen and Waterfront Workers' Trade Union (SWWTU). Even there, some in the union felt that his advocacy was quote unquote "too radical". His association with and participation in the Trade Union Movement continued throughout the rest of his life, whether as an active member of the Public Service Association (P.S.A.) or taking cultural support to workers strike camp. He went to the University of the West Indies at St. Augustine in 1991, to read courses in the carnival arts programme at the center for creative and festival arts (CCFA). He distinguished himself, graduating with first class honours. During his time at the CCFA, he created memorable theatrical performances in plays such as "Sing De Chorus", "Ten to One" and "The Black Jacobins", the latter based on the seminal work of C.L.R. James, another distinguished son of Tunapuna. I am told that Brian's final resting place in the Tunapuna cemetery will be a stone's throw away from C.L.R.'s. My cousin Brian's main experience with team sport was with a Cascade football side called Soul City. His sister Sandra, who acknowledges that she was less than dutiful in following Soul City's football achievements, claims that her only recollection of the side is that after a particularly raucous game against Crown United in June or July of 1971, the Trinidad Guardian headline on the match read "Tempers flare in Babes' Soccer". A brief suspension of the team may have ensued, but I will leave it up to the Soul City Stalwarts presents, including "Peeb", "Shine", "John Braff", "Rat and "Wrecker" to enlighten her, both on the team's achievements and on whether or not any suspension was ever imposed. Years later, I heard that Brian had come to an association with the Soul City Netball team, Girls This Time, as their chief cook and bottlewasher, also known as quote unquote "Manager" (Althea Hislop will bear this out). Brian was a library assistant at Barataria Junior Secondary, then at Malick Senior comprehensive and, at the time of his death, Librarian at the Mucurapo Senior Comprehensive School. He was committed not only to his work as librarian, but also to enriching his students' dramatic and cultural life as a whole. He taught them to appreciate that the characters in the Trinidad carnival have far more significance than most of us imagine. His was a pioneering effort in educating all of us. I am sure that like many of us, he was heartened by the recent reincarnation of the carnival institute under the formidable command of the indomitable Dr. Pat Bishop. His family can recall no early predisposition in him to anything having to do with the carnival arts, except that once a year he would be aware that uncle Norton Ince was playing again with George Bailey, maybe as Roman soldier complete with copper breastplate and helmet or as Taras Bulbar. Serious mas' and serious influences. Brian's career as a performer began at secondary school, continued as an artiste for the people at concerts in various communities and later evolved in more established settings. His uncle Edwin Crichlow was always a willing sounding board. In 1977 he began as a performer with the people's Kaiso Court and other tents, including the calypso theatre, Kingdom of the Wizards and Sparrow's Young Brigade. In 1981, Brian, now commentor, recorded "Guava Seaason", the lament of a retrenched worker, which changed the course of his life in that he came to see more clearly that his mission was to use his voice to reject attempts to alienate the people from their roots. And in many ways, he may have had an effect on all of us, as he began to immerse himself more deeply into the culture of our people, composing lyrics and then being transformed from calypso writer into the masquerade performer. He played Ole Mas', Bat and Dragon, but it is with his association with Alfred "Puggy" Joseph and the Mystery Raiders Midnight Robber Band and on becoming a Midnight Robber himself, "The Reincarnation of O Cangaceiro", that he found the persona and a voice with which he could commentary. And lest anyone doubt the seriousness of his ministry, he wrote in his 1998 article "The Midnight Robber, master of metaphor, Baron of Bombast" that the "Midnight Robber in his deep, dark, episodic description of duplicity and depravity is not a comic character"! It was the Midnight Robber work that was to captivate him completely and to which he devoted countless hours of research and discovery. He metamorphosed into a man who was happy with who he was, a man who could endure any suffering and who knew he would overcome despite all odds, content in the knowledge that he was opening up new vistas for his audience, using his art to denounce the unacceptable and to reflect the concerns of our people. Through his commitment, he promoted that performance tradition among young people, seeking to make them aware of the literary significance and cultural relevance of the Robber in the Trinidad Masquerade. Later, he used the Robber as a vehicle to promote social awareness. He believed strongly that the Trinidad and Tobago cultural traditions should be defended and railed against insidious cultural imperialism. He refused to accept that "what we cannot tote we should drag", as he said in his classic "Satellite Robber" in 1988. Brian was fundamentally a pensive, private and solitary person. His thoughts were his own, yet he was an intrepid social activist, a generous soul, who gave of his all in his every undertaking. He threw himself totally into those things he believed and was not afraid to agitate for what was fair, what was right and what was just. This commitment to being and advocate for justice saw him being arrested in 1986 when he protested outside the Oval, against the presence of so-called 'British Mercenaries', cricketers who had played in apartheid era South Africa while it was still under sanction from the international cricket council. 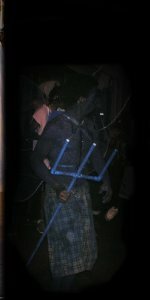 It was also in advocating for what was fair that he created "Satellite Robber" in lyrical protest against TTT's purchase of a million dollar satellite to facilitate more foreign programming on its channels. Brian was also a patriot. When a second medical opinion confirmed that the valve replacement surgery that had originally been recommended was no longer absolutely necessary, he believed, implicitly to our chagrin today. He died on May 17, finally succumbing to the heart problems, which had dogged him for several years. He joked two years ago that his doctor had reassured him by saying; "you will live until you die", and live he did. Completely, until the end, he did what he knew best in the way that he knew best. That brought him joy. And he, in turn, brought us to a new level of self awareness. May God bless and keep you, and all of us.